Comfortable rooms, hearty hospitality, well-kept garden with sunbathing lawn, indoor pool, Finnish sauna, infrared cabin, aroma steam bath, culinary theme evenings & in-house pizzeria. 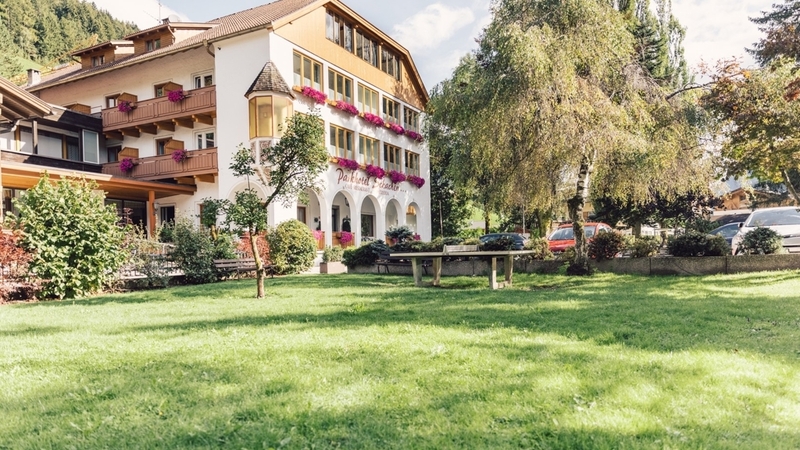 Welcome to Parkhotel Schachen*** in St. Johann! At our Parkhotel Schachen*** in St. Johann you will experience hospitality and a cosy ambience in the middle of a natural mountain landscape – the perfect destination for your holidays in Ahrntal! As soon as you arrive to the village, you can enjoy a deep breath of fresh mountain air and recharge your batteries with the energy of pure nature. Whether you want to spend some relaxing days together with your family or if you prefer an activity holiday – our Parkhotel Schachen is always the right choice for your stay in Ahrntal. The rooms in our hotel are cosy and spacious, suitable for couples or families. From your room, you can enjoy a wonderful view of the picturesque village of St. Johann, the green pastures and the peaks of the Alps. As well, you can enjoy moments of relaxation in our wellness area with indoor pool, Finnish sauna, infrared cabin and aroma steam bath. Make your reservation at least 60 days prior to arrival and receive a 10% Early Bird Bonus! Upon reservation, your credit card will be charged with a 100% prepayment. Book your vacation at least 60 days prior to arrival and enjoy a 10% Early Bird Bonus. Upon reservation, your credit card will be charged with a 100% prepayment. Nature is in full bloom and invites you to spend fascinating days with your family in our beautiful Ahrn Valley. Enjoy a picture-perfect summer with our mountain adventure days and discover the many facets of South Tyrol’s sun-kissed Ahrn Valley. Make your reservations now! Indian summer in the Ahrn Valley, unique and idyllic, inviting you and your family to explore nature and culture in a very special way. 4 adventurous days: Discover South Tyrol’s Ahrn Valley and its unrivaled highlights and enjoy your visit at our lovingly managed Parkhotel Schachen. Explore the Ahrn Valley's many facets and highlights starting out right at our Parkhotel Schachen at the heart of St. Johann and enjoy the hospitality and adventure. Make your reservations now! THE top all-inclusive price for families wanting to have more fun: Discover the entire wealth of adventures to be found in South Tyrol’s Ahrn Valley.